Whether you want reliable backup in case of power outage or to enjoy using modern electrically powered gadgets when you are camping, you will need a portable generator. There are several different types and numerous models from reputable brands so making a choice is not going to be easy. 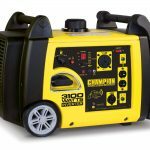 Take advantage of this dedicated buying guide and the best portable generator reviews to take the best decision in the end. These generators are compact and sufficiently light to be carried by hand. What makes them stand out is that they are safe to use for powering all types of electronic devices including more sensitive ones like computers thanks to their low total harmonic distortion (THD). They are also quieter than their counterparts. They typically produce up to 3,000 watts of power with many models having smaller capabilities. They typically use gasoline to run. The conventional portable generators usually run on gasoline or liquid propane. The engine is set inside a sturdy frame with two large wheels and a handle for portability. The power producing capacity varies greatly between generators, from 1,000 to 10,000 watts. These generators have features comparable to those of their conventional counterparts and use the same types of fuel to run, but are much more powerful. Their power capacity is very high, usually well above 15,000 watts. They are usually used to provide backup power on commercial premises. They can also be found on construction sites. Founded in 1908, Briggs & Stratton is one of the staple names in the generator industry. The company makes conventional portable and standby generators plus inverter ones. They have special models for commercial use. You can select from a variety of capacities with this manufacturer. 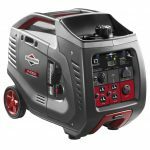 Briggs & Stratton 30545 is a portable inverter generator with four 120-volt AC outlets and single 12-volt DC outlet. This generator is your best companion during power outages and keeping your electric appliances running. It has rated operating power of 3000 watts. It is powerful enough to start the air conditioner of standard RV. The noise is quieter than other camping generators in the market. This model has an impressive 10-hours run time on 25% load with its 1.5 gallon fuel tank. That is almost half-liter consumption an hour. It also comes in 2200 watts model, which is approximately half the price of 3000 watts model. This US-based manufacturer offers inverter and conventional portable generators for residential, commercial and recreational use. With the conventional ones, there are numerous capacity options ranging anywhere from 1,200 to 12,000 watts with the 3,500-watt and 5,000-watt being among the most popular. You can select from models with pull, electric and wireless remote start and ones with gas, propane or dual fuel operation. Champion 75537i is an ideal generator for trailers, RV, tents, and tailgating. It has 2800 running watts and 3100 starting watts, with run time of 8 hours on 25% load with its 1.6 gallon tank. It’s quiet running operation is ideal for comfortable use with basic needs such as lights, laptops, microwave, TV, and refrigerator. It also comes with wireless remote that is operational from the distance of 80 feet away, to start the generator. The unit also has USB adapter and spark plug socket. The Duromax portable generators come from a manufacturer called DuroPower. The company is based in California and makes the engines for the machines. Even though the brand’s range doesn’t boast with huge diversity, buyers can choose from single, double triple and four-cylinder engines. 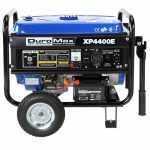 DuroMax XP4400E is 3500 watts generator with speak performance of 4400 watts. It has 7 horsepower air-cooled OHV engine, with easy electric start as well as recoil start. You get Voltage Selector with this model, with ability to choose 120 and 240 volts. It’s 4-gallon tank allows 8 hours run time on 50% load. The output current is quite stable, thanks to its advanced automatic voltage regulator. Another impressive thing about this model is its quiet operation at EPA approved rating of 69 dBA. Founded in 1959, this company is one of the oldest manufacturers of portable generators in the United States. They produce models for residential and business use. In their homeowner range, you can find both inverter and conventional generators. They have more basic and more feature-rich models. Among the latest advanced technologies introduced by Generac is the patented OHVI engine offering superior performance. 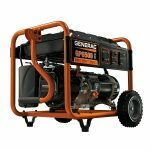 Generac 5940 is a gas powered portable generator with 6500 running watts. It has 389cc OHV engine, circuit protection, and 6.7 gallons fuel tank. The starting watts are 8,125. If running at 50%, it will give approximate run time of 10 hours. Safety features include engine lubrication, increasing overall life. It shuts down automatically when the oil level is low. Flat tires on this GP6500 generator makes it portable enough. This Generac generator is ideal for camping and outdoor events. It is automatically an easy choice for home use as well. This Japanese company, which is best known for making motorbikes, produces various types of power equipment including portable generators for home, business and recreational use. They make inverter, conventional and professional models. One of their latest technologies is the Digital Automatic Voltage Regulator, known as DAVR for short. The fuel-power models equipped with it have high voltage stability to produce more consistent power. 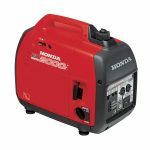 Honda’s EU2000I is a 2000 watts inverter generator with recoil start. It is super quiet at low level noise of 59dB at rated load and 53dB at 25% load. It runs for up to 8 hours with 25% load, and approximately 3.5 hours with rated load with its 0.95 gallon fuel tank. This generator is very much comparable to Yamaha 2000, and most often buyers will choose this one over the Yamaha. Honda EU2000I is equipped with the powerful Honda GX100 engine. This brand’s standby and portable generators fall into three categories – commercial, portable and home backup power. There are different capacities and fuel options to select from. This company is best known for its medium-sized models producing between 5,500 and 7,500 watts of power. Honeywell 6037 is a gas powered generator with electric start option. It produces 5500 watts and can reach up to 6875 watts. It has 389cc OHV engine, and is equipped with 5.8 gallon fuel tank made of steel, which provides approximate run time of 9 hours on 50% load. Honeywell 6037 is a portable generator with heavy-duty wheels, making it easily movable even on rough surface. 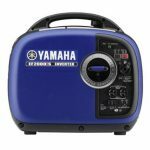 As one of the best-known Japanese manufacturers of portable generators, Yamaha has always been synonymous to quality. The brand offers both conventional and inverter generators, with the latter being much more popular. There is a large selection of models having different capacities and features. Yahama EF2000iSv2 is 1600 watts gas powered portable generator, starting at 2000 watts. It has a compact lightweight design, is very quiet at 51.5 dBA at 25% load, and comparable to Honda’s EU2000I. Its has 1.1 gallon fuel tank with run time of 10.5 hours at 25% load. You can also connect in parallel two units of EF2000iSv2 to generate more power. When you plan to buy a generator to provide backup power in your house, you can choose between portable and standby models. The latter are installed outside on the property and are directly connected to the home’s power grid. It is worth noting that this option is available with portable models too when a specially designed power switch is used. Let’s take a closer look at the benefits and drawbacks of both options. Portability – You can set the generator in any place where it is needed as long as the location meets the safety requirements. Flexibility – These generators give you the opportunity to power individual appliances directly by using an extension cord to plug them directly into the integrated electric outlets. No installation required – This saves you a great deal of hassle and money too. Multiple uses – You can use your portable generator for backup power, for powering equipment on your property and for using various appliances and devices when you go camping. Refueling needed – You have to store sufficient amounts of fuel, be it gasoline or propane. To preserve gasoline for longer, you need to add stabilizer to it. Manual start in some models – Using the pull cord requires effort and the engine may not start very quickly. There are models with electric start, which requires a battery. Automatic backup – The standby generator is connected to the home’s power grid during installation and stars working automatically in case of a blackout. Large capacity – Standby units can supply up to 20,000 watts of power, which is two times greater than the maximum capacity of portable models, meaning you can power even an AC system. Models with advanced technologies available – These include technologies for lower noise production, for self-diagnosis and for monitoring via a connected device. Quite expensive – The standby units typically cost between 2 and 10 times more than the priciest portable models. The installation costs have to be added to the bill too. Pre-selected settings – The electric circuits which are to receive backup power are selected in advance so you don’t have flexibility unless the generator can power the entire house. This is a thermal switch designed to provide damage protection in case excessive current passes through. All electric outlets of a portable generator have circuit breaker protection. This is a unit of electric power. 1 kilowatt is equal to 1,000 watts of power. The capacity of portable generators is more often displayed in watts. If the engine runs low on oil, this feature automatically shuts it down to protect it from damage and to prevent failure. This abbreviation stands for overhead valve. Overhead valve engines have their valves positioned over the piston in the head. This makes them more powerful compared to their traditional counterparts. This is the amount of power which a portable generator can produce on an ongoing basis. It is often referred to as rated load. This is the amount of power which a generator can produce for a short period of time. This is a measure used for the quality of electricity. The amount of THD may influence the performance of electrically powered equipment. Portable generators with very low THD can be used for powering sensitive equipment. This device is designed for connecting the generator to the electrical system of the house and disconnecting the system from the main grid. If you are contemplating between an inverter generator and a traditional one using an engine, use this list for comparing the two options and making a final decision. Compact and fairly light – The smaller models, in particular, are designed to be carried by hand. The bigger ones have two wheels and a handle. No more than 3,000 watts of power – Most have running power between 1,000 and 2,000 watts. Low total harmonic distortion below 5 or 6% – The result is the production of “clean” electricity which is safe for powering sensitive electronic devices. Best suited for recreational uses – They can easily fit in a car, RV or boat and are often used at campsites for powering TV sets and small kitchen appliances. Capacity up to 10,000 watts – The most popular options include 3,500, 5,000 and 7,500 watts. Best used for home power backup – It is possible to connect them with a transfer switch for powering the entire house or specific circuits rather than individual appliances. The two options to pick from are gasoline and propane. While gasoline is readily available and usually easy to find and to stock on, it also tends to be pricy. Besides, you will need fuel stabilizer to keep it in good condition. Propane comes in cylinders so it’s difficult to spill and has clean burning. You can store it for a very long time and it will still burn well. The drawbacks of propane generators include the more complex fuel system, the lower efficiency compared to gasoline and the fact that it won’t burn in very cold weather. All inverter and conventional portable generators feature a number of different electric outlets. Usually, you can find AC ones for powering appliances and a DC one for charging batteries. There are also models featuring a twist lock for using a transfer switch and ones with an RV receptacle for transferring power to the electrical system of the vehicle. The running watts show you how much power the portable generator can produce on a continuous basis. They determine the unit’s capacity. A portable generator with a bigger tank will require refueling less often so it’s more convenient to use. However, it will also take more space and be heavier and more difficult to move around, especially when the tank is full. Most portable generators have noise levels between 47 dB and 75 dB. Usually, the greater the capacity is the noisier the unit is. The leading manufacturers are using more advanced technologies to prevent the noise levels from exceeding 60 dB. Calculate how much power you will need to select the optimal capacity. Decide which devices you’d want to power simultaneously including lights, appliances, electronics and so on. Check their running watts (you can use charts available online, but it’s best to check the actual items). Sum all running watts and add the starting watts of the device which requires the most power to start. The total is the capacity which you need to look for. Choose a portable generator which has the same running watts as the total. Consider the estimated runtime with caution. The runtime shows how long the portable generator will work for at 25% or 50% load (capacity) after starting with a full tank. Always compare runtimes calculated at the same load. Generally, if you use will use the generator for backup power, you will benefit from a longer running time. Check the type of start which the portable generator has. The traditional pull cord start is usually reliable, especially when the temperature isn’t too low, but not very convenient to use. The electric start is usually faster and easier to use, but requires a battery. More advanced portable generators come with wireless remotes for super convenient start. Evaluate the portability of each model. When comparing conventional portable generators, check the size and make of the wheels, the design of the tires and the ergonomics of the handle. The inverter ones should also have a comfortable handle. Expect bigger models to have small wheels too. Find out what accessories are included in the package. You will need a funnel for filling the tank with fuel, oil for keeping the engine in good shape and a power cord for connecting devices to the generator. In case of an electric start, you will also need a battery. A cover is necessary to protect the portable generator when it’s not in use. You can now decide on the right type of portable generator for you. You can also select its capacity, features and accessories based on your individual needs. With the help of the best portable generator reviews, you will know exactly which model to pick.